JY: Can you tell us about Clay Collection and Speculative Plane? What does the title stand for? GM: Again you find his [Estermann’s] inclination to believe in the future. Itʼs the third representation of a work already done several times with his students, now for the first time he did all parts himself. 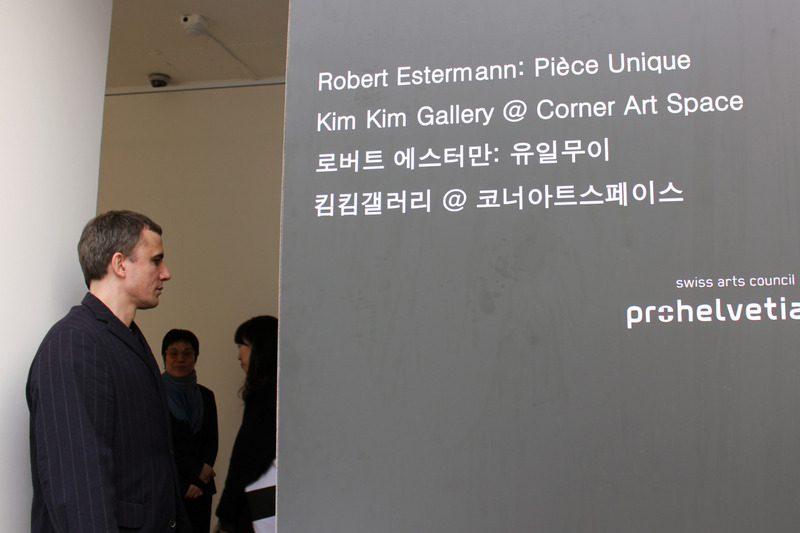 Very unnervingly, we as Kim Kim Gallery, me and Nayoungim, had to wrestle him into doing it. He was very reluctant, to put it lightly. But it went all quite well, don´t you think? 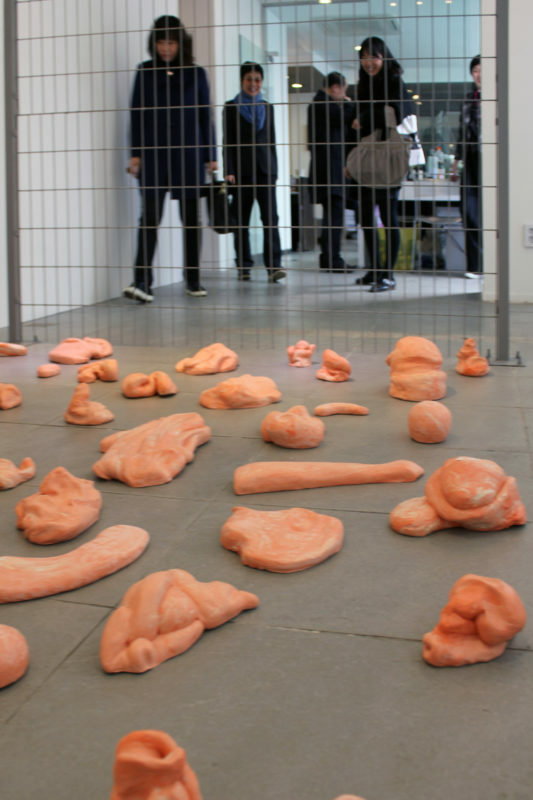 The barrier here, he says, the barrier promotes, we have to say as a component of the installation the topographic objects on the other side of the barrier. The barrier is giving us a certain perspective on the work. At this point he likes to talk about Albrecht Dürer, representing something in correct perspective, as a dimensional row. The audience may have to pass around the barrier on the side, that should provoke, in Robert´s opinion, a form of desire because you cannot access it directly. But one wants to, so evidently we have to go around it. The objects themselves on the ground are a mixture. 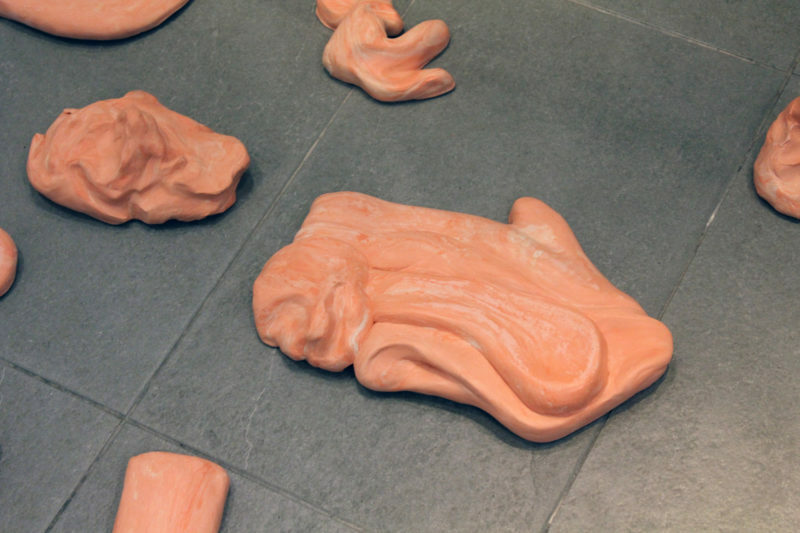 All of these snail-like forms on the floor remind us of tongues, limbs and faces and mathematical topographical representations. But none of these too closely, you can not clearly distinguish a face or tongue. On the other hand, they are like mockup mathematical topographies. Over there is a table costumized to Robert´s specifications. It had to be, his work has to be on the millimeter exact, at least. It has to have the right shape, the right texture. Everything, every little detail is important in Robertʼs works. There you have the plane which is totally flat, thereʼs no inclination, itʼs a plane of exchange. It means: a counter. It talks to us about capitalism, the flux of money. Which he sees as something very positive and real. He sees it as part of the universal calculator of Konrad Zuse, and it also appears in a different form in Ray Kurzweilʼs writings. The money thatʼs one of the places in this universe where you can actually see numbers. Thatʼs very funny. Robert says capitalism is positive. He is not talking about poor people or rich people. He is just talking about money. Here even the snails on the ground want to be on the table. And they want to be exchanged into something else. So there is potential in it. But they unluckily can´t move. 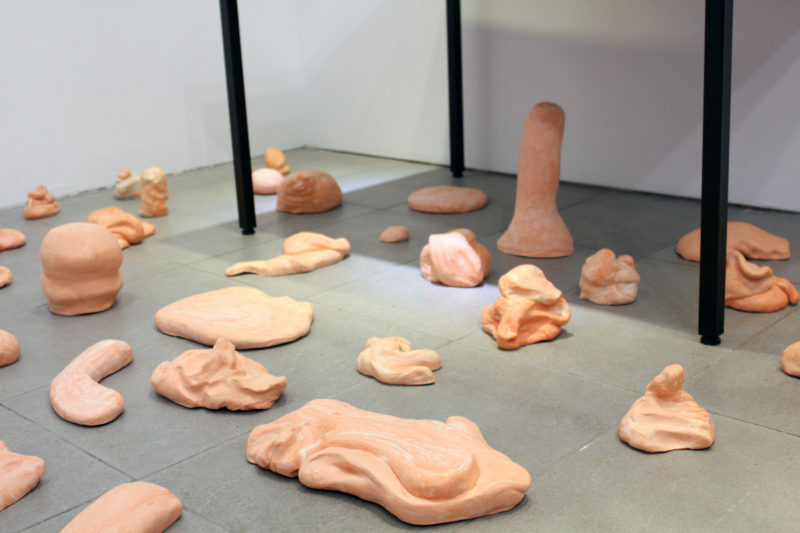 The installation is called “Clay Collection and Speculative Plane”. The show is called “Pièce unique” because we think that Robert’s way of thinking and working is “one of a kind”. Itʼs a single piece, a single installation with three components. And yeah! 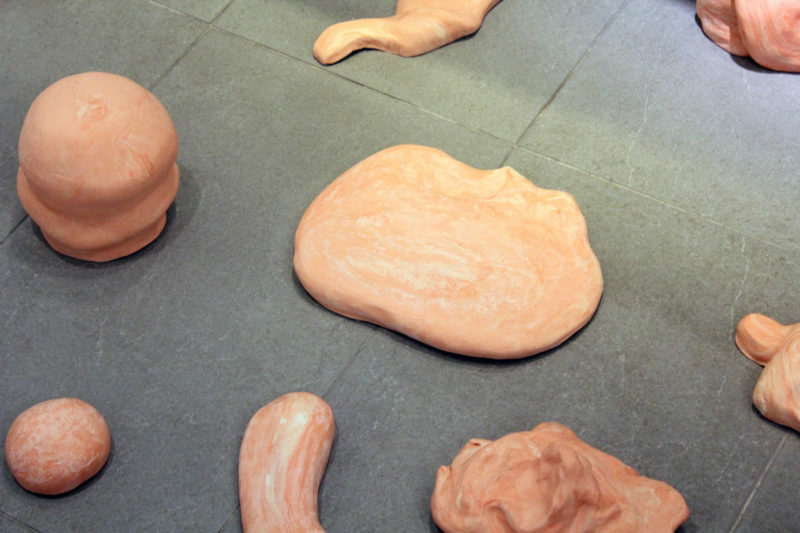 Itʼs true “tongue-in-cheek” would be an appropriate title for this piece because the clay is made of polyurethane. Funny, no?